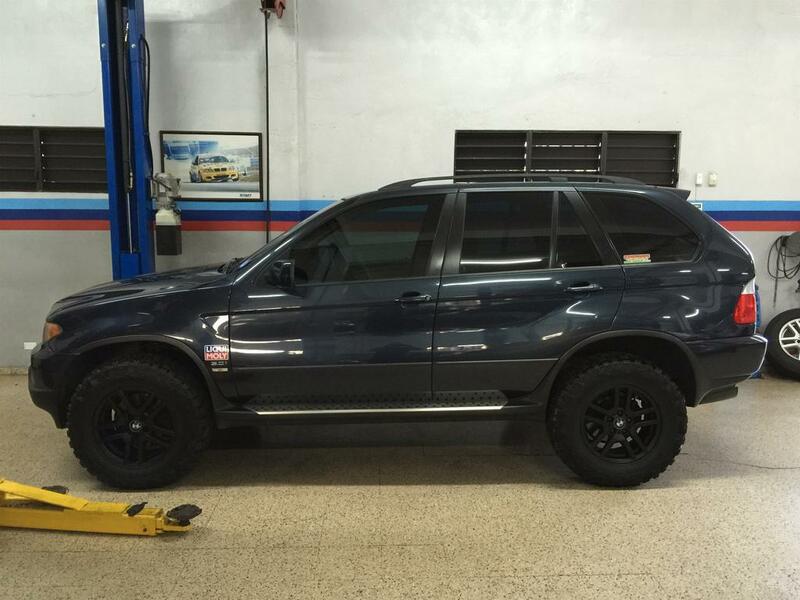 Looking for lift and tire idea/suggestions for our E53s, now, obviously X5's weren't designed for overlanding or anything crazy but with the guides being soon replaced on my M62tu I figure I might as well go all out and make a fun semi-reliable SUV. So i'm looking for ideas and suggestions that don't consist of "get a Toyota or Jeep". Trust me, i've looked and the only thing remotely appealing was the FZJ80 and 4runner, but with its camry-like interior and 14 MPG... I decided to pass. As someone who used to drive a late 70's 4x4 as a daily driver, I have always had a thing for this idea. I have recently seen the kit you posted, but have never seen anyone use it. Before that, the only kit that was guaranteed to work was one made by Fluid Motor Union (advertiser on this site). They developed a CNC'd strut spacer some years back, and were building it nearly JIT for $600. FMU lift is likely to be what is on that truck you posted. I say that because 2" of lift over stock isn't likely to clear those tires. I have searched around for this kind of thing since 2005, but that's about it. I did do some research on them, I didn't find anything other than some group buy. If there's nothing else around and options are really that limited, i will definitely give them a call and see if I can get some made... if they're still producing. I recently posted about installing 265/70 17 on my manual 3.0 X5. It has changed the driving quality for the better. The ride is fantastic, the tires fill out the wheel wells, no rubbing and can finally use 1st gear. I have contacted fluid motorunion about there lifts but they do not have any right now. I may try the ebay kit. It looks like it will work??? I have 7" LED off road lights that I will be mounting to the front end. As the X5 get less expensive I think they are great candidates for rally dakar looking machines. Agreed! Do you have any pictures? I'd love to see. Before I bought the style 57 wheels I was looking at Chevrolet steel wheels like the D spoke or soft 8. Basically the same bolt pattern and all one needs is a hubcentric adaptor. The nice thing about chevy wheels is the 0 offset and the authentic off road look. Maybe when you get your build going we all can start an off road / rally thread. The beedlock look is pretty cool as well. Yeah I was looking at those style wheels but I couldn't find any that fit the X5 but I do remember seeing either ford or chevy had similar bolt patterns. That may be something to look into. My guides are going to be rebuilt on the X5 at the end of this month and after that i'll be replacing the rear air bags so I hope to have lift ideas in before I get started on that. Also before then i'd like to find some cheap steelies or OEM wheels.